Turning Leaf Literacy Center exists to provide intensive, one-to-one clinical intervention in reading, math, and writing: and academic assistance in all subject matter. We consistently and systematically equip all individuals with specific, effective, and research-based tools to empower them to overcome learning and processing challenges so that they may achieve academic excellence. We partner with those who value education and we advocate for their loved ones. This provides relief from seemingly unsuccessful methods. Turning Leaf team members are passionately committed to excellence as they nurture individual potential. We create an atmosphere of loyalty and integrity by inspiring confidence in every interaction. Turning Leaf strengthens the community by supporting families and developing confidence in students. At our learning center instruction is based on an individual’s learning needs and embodies an interactive, balanced approach. 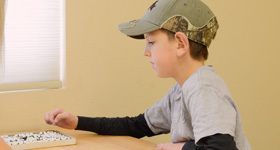 Through Socratic questioning, Turning Leaf Literacy Center teaches students to integrate sensory information to help them become self-correcting and independent in all learning skills. The math tutors and reading tutors in our learning center utilize Lindamood-Bell® concepts and techniques. The programs and course outlines listed below will be recommended according to each individual’s learning deficit. While each hour’s activities will remain primarily the same, the complexity of each hour’s activities will gradually increase in accordance with the individual’s success at each level. Using the evaluation results we are able to create and customize an individual plan for each student. This plan is then implemented at a rapid pace incorporating phonological awareness, decoding skills, and symbol imagery in order to reach the ultimate goal of reading independently with accuracy and fluency. *Turning Leaf Literacy Center is NOT Lindamood-Bell Learning Processes nor is it affiliated with, certified, endorsed, licensed, monitored or sponsored by Lindamood-Bell, Nanci Bell, Phyllis Lindamood or Pat Lindamood. Lindamood-Bell – an international organization creating and implementing instructional methods and programs for quality intervention to advance language and literacy skills – in no way endorses or monitors the services provided by Turning Leaf Literacy Center.